You don't have to go to a restaurant to get a good, simple salsa. 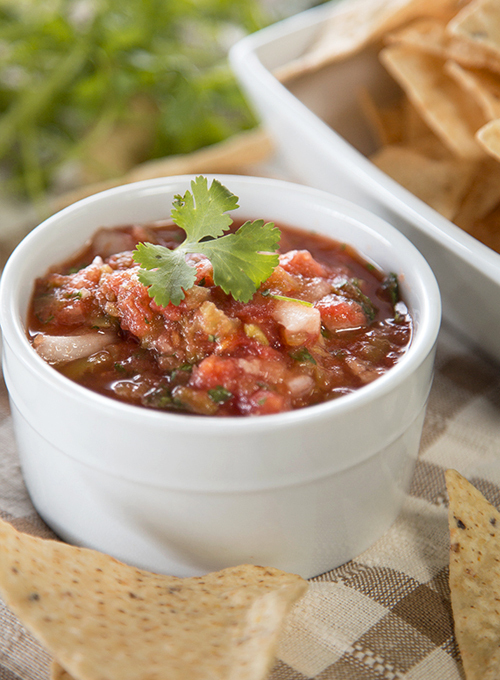 This salsa is so easy to make and is the perfect summer dip! You can kick up the heat by adding a little cayenne pepper or fresh jalapeños. You can even make a spicy chipotle salsa (instructions on the recipe page in the "Variations" section). It's especially tasty with homemade tortilla chips (instructions below). You won't regret trying this Blendtec favorite! Add green chilies, lime juice, garlic, salt, and cumin to jar and secure lid. Press "Pulse" 3–5 times. Add tomatoes, onion, and cilantro. Secure lid and "Pulse" 3–5 times. To make baked corn tortilla chips, cut corn tortillas into eighths. Spray with cooking spray and sprinkle with salt, cumin and chili pepper, or desired seasoning. Bake at 350°F for 6 minutes. Use a spatula to flip chips and cook another 5-8 minutes until crisp and golden.